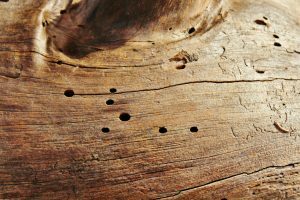 Make no mistake about woodworm, it is a pest – and you will certainly know they’ve been making themselves at home thanks to their destructive nature. Woodworm are actually beetle larvae, and as they make their way towards becoming a fully-fledged beetle they spend a lot of time munching through wooden structures. Seemingly attracted to damp wood, beetles lay their eggs on the wood and as these form into larvae they feed on the material. Once having found a good damp wooden base, beetles will perpetuate the cycle as the new adults choose the same spot to lay their eggs, which go on to cause more destruction. So how do you know you have a woodworm problem? Taking action as soon as possible after spotting the signs of a woodworm infestation is vital as the effects of them boring through the wood can weaken structures. One problem with woodworm is that the infestation can often not be seen if the exit holes are not visible. The most commonly used method of getting rid of woodworm is to spray the affected area with an insecticide. This will need to be done by an expert, who will thoroughly check the affected area to see the extent of the infestation and whether it is still active. Treatment with insecticide is quick and effective, however if there is an underlying reason for the woodworm infestation, such as damp, this will need to be fixed to avoid the problem happening again. If you are concerned that you may have woodworm at your property, or would like more advice about insect control, please contact Pest Busters for advice.